Primary schools across the UK are urged to register for the Communication Triathlon! Primary schools across the UK are urged to register for the Communication Triathlon today! With 300 days to go until the start of the Olympic Games, primary schools across the UK are being encouraged this month to register for the Communication Triathlon and join thousands of children and staff across the country who have already ‘exercised’ their speaking and listening skills. The Communication Triathlon has been developed in partnership between Openreach and I CAN, the children’s communication charity. The Triathlon is a series of active and fun-filled events for primary schools, intended to boost speaking and listening skills, which can be undertaken by a class, a year group or a whole school over the course of a week or even a day. The programme encourages children to take part in three London 2012-themed speaking and listening activities around Thinking, Talking and Teamwork and is split across 4-7 and 7-11 year olds. The Communication Triathlon is free to take part in as it is supported by Openreach, BT’s local network business and is part of Get Set, the official London 2012 education programme. Openreach will donate 100GBP to I CAN for each of the first 500 primary schools that register to take part in the Communication Triathlon. Openreach is the official Telecommunications Infrastructure Partner for the London 2012 Olympic and Paralympic Games. The Communication Triathlon provides children with lots of opportunities to practice communications skills linked to the Olympic and Paralympic Values. Openreach maintains and improves the network that connects tens of millions of homes and businesses to telephone exchanges across the UK on behalf of our Communications Provider customers, who sell communications-based services to consumers and businesses. Openreach is also the lead deployment arm of BT’s 2.5 billion GBP investment to make Super-fast Fibre Access available to its customers across the UK, which in turn means that up to two-thirds of homes should have access to super-fast broadband services by 2015. Openreach has supported I CAN since 2006 and are committed to making a real difference to the lives of thousands of children and their families. Openreach is responsible for the nationwide local BT network which connects homes and businesses across Britain to communications providers' networks. Openreach provides communications providers with services and products associated with that network. In the year ended 31 March 2010, BT Group’s revenue was 20,911 million GBP. We are here to ensure that no child is left out or left behind because of a difficulty speaking or understanding. Nobody wants a child’s potential to be wasted. It happens because communication difficulties are not visible, often mistaken for something else, or not noticed at all. I CAN’s mission is to make sure that everyone in contact with children knows how important communication is, what a communication difficulty looks like and what they can do to help. At the very heart of I CAN are our special schools which give expert care and education to children with problems so severe their needs cannot be met elsewhere. 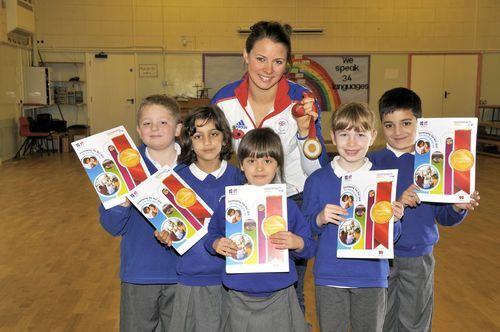 Get Set is the official London 2012 education programme for schools and colleges across the UK. It provides free learning resources for 3-19 year olds to find out more about the Games and explore the Olympic Values of excellence, friendship and respect, and the Paralympic Values of determination, inspiration, courage and equality. It also offers access to exciting prizes and opportunities through participation in competitions and partner programmes. There are over 15,500 schools and colleges registered with Get Set. The Communication Triathlon is part of Get Set + and is featured within the Communication, Collaboration and Citizenship theme. The Get Set network is the London 2012 reward and recognition scheme for the active community of schools and colleges across the UK that are demonstrating a commitment to living the Olympic and Paralympic Values. Members of the network gain the right to use the London 2012 education logo, and are given priority access to the most exclusive prizes and opportunities. There are currently over 1000 members of the Get Set network. All schools participating in the Communication Triathlon are encouraged to join the Get Set network to benefit from even greater reward and recognition from London 2012. An Olympic and Paralympic first, the London 2012 Inspire programme officially recognises outstanding non-commercial projects and events inspired by the Games. The Inspire programme is run by the London Organising Committee of the Olympic and Paralympic Games. It is an opportunity for everyone to be part of the London 2012 Games – a broad participating programme spanning sport participation, education, sustainability, volunteering and business opportunities and skills. New opportunities are being created to inspire young people and encourage the whole of the UK to join in. This press release was distributed by ResponseSource Press Release Wire on behalf of I CAN in the following categories: Children & Teenagers, Education & Human Resources, for more information visit https://pressreleasewire.responsesource.com/about.